Infacol is an antiflatulent which means that it helps to bring up wind or air trapped in the tummy. 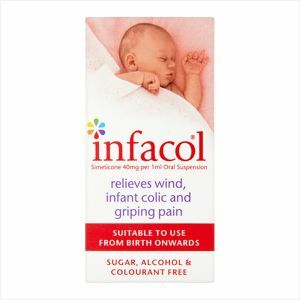 Infacol is given to babies to relieve griping pain, infant colic or wind due to trapped air. It can be given from birth onwards. The pain associated with colic may be caused by the build up of small gas bubbles trapped in your babys tummy. Dosage: One dropper full (0.5ml) given before each feed. If necessary this may be increased to two droppers full (1ml). To use: Shake bottle. Draw up one dropper full by squeezing the rubber bulb twice. Wipe any excess into the bottle. To administer squeeze the bulb and release. If symptoms do not improve seek medical advice.